READY – SET – GLOW! Description: Ready, Set, Glow! A low-key, 5-mile trail run in the dark on the winding trails of Dryer Road Park. 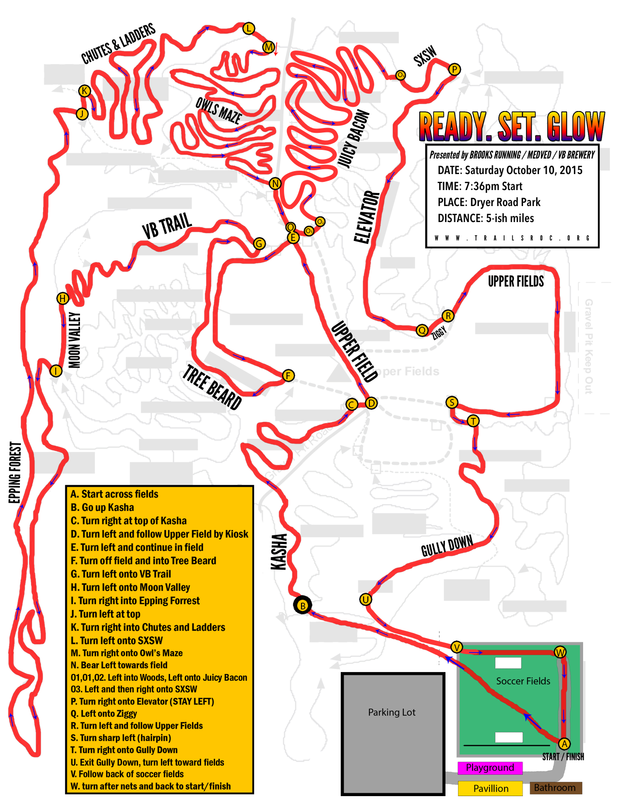 Trails will be marked with glow sticks and things that go bump in the night. Finish the race and celebrate with a glow necklace/bracelet, food, and a blacklight party where you can decorate your shirt with highlighters! This is as “green” a race as it can be (we realize glow sticks challenge this assumption)– The water station is refill only and is at the finish. Each runner will be required to carry their own hydration system on the course with them if they need water. There will not be cups available at the refill stations!! Awards: Totally awesome and totally RANDOM if we have any at all – Every race gives the winners something – This race is about fun so everyone has an equal chance. Finish the race, have a chance at a prize! The course starts and finishes at Dryer Road Park in Victor. Dryer Road Park is one of the only shared-use trails in the area. As a trail running group, we believe in trail advocacy and LOVE that this is a park where anyone can get off-road–be it through hiking, biking or running! The windy single track and interesting trail names (like Juicy Bacon or Chutes and Ladders) will make a perfect setting for a night-time fall race! #TrailsRoc Gives Back: The Genessee Regional Off-Road Cyclists (or GROC) helps to maintain the trails at not only Dryer Road Park, but also Tryon Park, Bay Park West and Whiting Road Park, just to name a few. You can go here to see what other trails are mountain bike friendly and maintained by the GROC crew. Part of the proceeds from this race will be donated to them to help in their efforts to keep the trails beautiful for all of us! In addition to trail work – We understand the needs for first responders and all of our races donate money to the local fire departments!